Bookshelf Diagnostics: helps with troubleshooting the connection issues with Bookshelf. Bookshelf Help and Support: In case you need help with Bookshelf visit the Vital Source website. 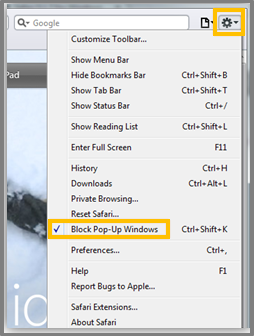 Uncheck the Block pop-up windows check box. 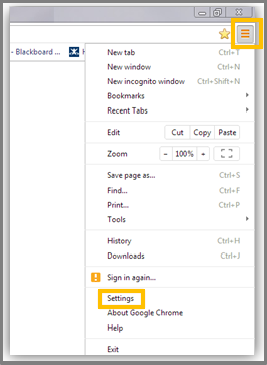 Click the Customize and control Google Chrome button next to the address bar. Click Show advanced settings at the bottom of the page and scroll down to the Privacy section. In the Content settings window that comes up scroll down to the Pop-ups section. Click the Allow all sites to pop-ups radio button. Un-check the Turn on Block Pop-up Blocker check box. Click the Display a menu of general Safari settings gear button. Click the Bookshelf Help and Support link through your Blackboard Learn course and the Bookshelf by Vital Source page.